As a Dodgers fan, I don’t often see the Red Sox play. So you can understand my excitement when I saw the Red Sox were coming to town. The first team that I ever played for was the Red Sox, with my city’s Coach Pitch League. I wore the number 2, which is the same number that Jacoby Ellsbury wore when he played for the Red Sox. Of course at age 8, I didn’t think about the fact that I shared a number with a real player. 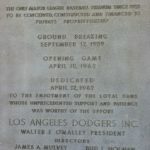 According to baseball-reference.com the Dodgers and Red Sox first played each other in 2002. They have now played a total of 15 times. They have won 7 games and have lost 8. The Dodgers have won 6 and lost 3 at home, and have won 1 and lost 5 at Fenway. The first series against the 2 clubs started on June 21, 2002 in Los Angeles. The Red Sox sent out pitcher Josh Burkett against Dodgers pitcher Hideo Nomo. The Dodgers won the game 2-3. The Dodgers also won the other 2 games of the series. The Red Sox started off well in the first series at Fenway Park. They won the first game by a score of 1-2. The Dodgers won the second game 14-5 and lost the third game 4-1. The Dodgers played 3 more games at Fenway in 2010, and again at Dodger Stadium in 2013. 3 years later the Dodgers and Red Sox were at it again, but before game 1 they stopped to honor David (Big Papi) Ortiz. I didn’t have a clue about anything from his childhood or his charity. I really respect him after that. Well the Red Sox came out in true Boston form, scoring 9 runs, 4 of them off of Scott Kazmir. What was surprising was the pitching; Steven Wright pitched his first career complete game shutout. He dominated as the Dodgers were unable to hit his knuckleball. Game 2 was more of the Los Angeles for and they won it 0-3. Ross Stripling pitched well and the bullpen held it together for Kenley Jansen to collect the save. Game 3 was more of the crazy batters game, it ended with a final score of 5-8 with the Dodgers capturing the victory. Both teams had and have many great players, all of them had great accomplishments, but only a few have their numbers retired or are in the hall of fame.